A wonderful and luxurious gift for a loved one – or for yourself! - Height: 3in (7.6cm). swan mnnn (incl GB) A 23 1019 1239. #10 La Roue De La Fortune Miniature. Red Miniature. History: Mrs. Arness states this was a gift from Jim. 1983 Estee Lauder (Cinnabar). The item is in excellent condition. The fragrance is "Youth Dew". The compact closes securely. Tiny green rhinestone chaton eyes. Full unknown scent. Resembles Max Factor Aquarius design. Lovely openwork two-sided design. Compact does not appear to have been used. The decorative box show signs handling wear. I strive to take pictures from every possible angle. I do NOT hide blemishes, I try to emphasize them. These fees will be the responsibility of the recipient. 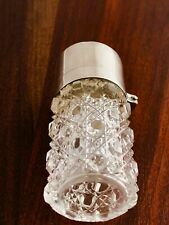 An antique cut glass scent bottle, with solid silver fittings, hinged lid and chain hanger. A lovely example.so collectible & very wearable! DATE/MARKS : 19th Century. See below for further details. The scent is Pleasures. Note the original display case/box. 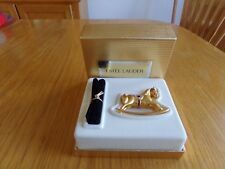 Marked with the original sticker, on the inside lid “Estee Lauder 2000” as well as on the exterior of the display case. Hinge and clasp is great working condition. The color is green with yellow marbling and lots of translucence. It also has a pink rhinestone on lid. Hinge works fine so as the clasp. Lid can be lifted off the base. Pretty ornate embossed leaf design on base. LID HINGE IS SECURE. LABEL STILL INTACT. Case in good condition - no indication of maker. The compact has a magnetic closure and closes with a lovely snap. Limited edition, this collectible makes an unforgettable gift. FOUR LEAF CLOVER. This b eautiful and r are piece,h ard to find will make a wonderful addition to any collection. Vintage USSR/Soviet Russia Perfume Set " ДЫМОК ". Outstanding gold tone compact representing an ancient Chinese junk. This extraordinary and r are piece will make a wonderful addition to any collection. Goldtone case. 3/4" thick when closed. It's unsigned. Wish I knew who made this. Beautiful brocade flowers on a cushion top. Very little missing. Galalith pieces are machined. or Celluloid or Lucite is considered to be a top quality chunky plastic. Galalith is impossible to test like genuine. Bakelite are testing the phenol component of the material which is inexistant in Galalith (replace by milk protein). Full Aquarius fragrance. Tight spring hinge must be held open. It does not use mineral oil or wax at all, it is made of jojoba oil, olive oil, shea butter, beeswax, etc. and I always combine as possible. Chain - one way - clasp to compact 14". Chain not included. Hinge and clasp are tight. Finish is still nice and bright. There is a bale attached at the top allowing it to be worn as a necklace. Good condition. Cool little collectors item. VINTAGE ESTEE LAUDER YOUTH DEW SOLID COMPACT PERFUME BLUE STONE PENDANT NECKLACE. Condition is Used and in good condition, please see my photos for your own determination. Measurements: 1.75 inches wide and tall If you have any questions feel free to ask. I will help as best as I can. Please see my other lots. I will combine shipping. Lid centered with prong-set, mottled turquoise colored cabochon, surrounded by tiny solid turquoise cabochons (one missing) on bright goldtone filigreed case. 7/8" thick when closed. Beautiful two pieces (lamp and stand) silvertone compact representing a hanging lamp. This b eautiful and r are piece,h ard to find will make a wonderful addition to any collection. 2001 Harrod's Limited Edition - IntuitionFragrance. This beautiful oval brushed gold tone compact is decorated with a faux amber stone drop at the centre and was issued exclusively for Harrod's to celebrate the launched of Intuition fragrance. Missing the black rope-like cord. Empty, originally heldYouth Dew fragrance. T urquoise Cabochon centered on bright Goldtone Rope Case, twisted clasp. We 'll try do everything we can to resolve the issue. For condition see photo. Embossed detail, hinged lid. Minimal wear to gold tone. Adjustable black fabric, rope like cord.